At the end of the summer, ideas for swims come flowing into my head as though as though anything is possible after a long winter in the pool! 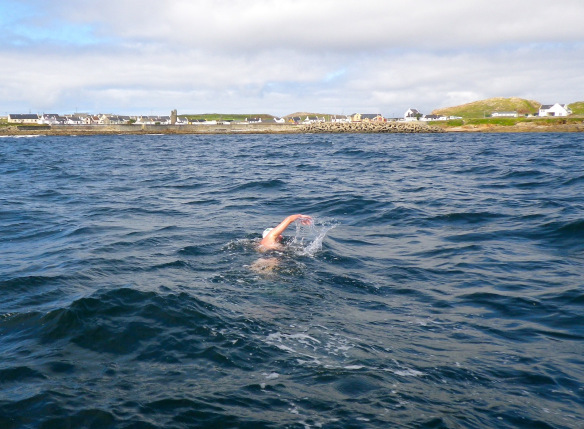 In 2011, an idea hit me to swim from Tory Island to mainland Donegal, a distance of 13.7 km. I knew that it was possible as Anne Marie Ward from Donegal and Kieran Fitzgerald from Sligo had already done it. It had been in the back of my mind to do it since I was in 3rd Year in secondary school, when I heard, in an Irish listening comprehension test, about Anne Marie’s swim of over 8 hours. Anne Marie is a friend of mine and when I mentioned that it was in my mind to do this swim, she offered to help me in whatever way she could. Without further delay, I decided to give it a go! On coming home from one of my trips to Dover, I saw on the weather forecast that there was to be a swimmable day on the Friday of that week (17th August 2012). I called Anne Marie and we arranged to meet in Letterkenny on the Thursday. It was an arduous journey from Fermoy to Letterkenny! After meeting Anne Marie at the bus station, we headed north to her house, we had a bite (actually a big meal) to eat and put together all of the things that we would need for the swim. Finally, Anne Marie called Brendan Proctor from the Sheephaven Sub-Aqua Club and he said that the weather would be good enough the following morning to swim from the mainland out to Tory, rather than the other direction. In the morning, we got up early and drove to Magheraroarty, the starting place. On our way there, we passed through places that I had only ever heard about on the radio, Gortahork and so on. When we arrived at our destination, the sun was shining and there was little wind. Magheraroarty is a beautiful place with a large pier, white sandy beach and clean, clear water. After a while, Brendan and John Joe from the Sheephaven Sub-Aqua Club arrived with the boat. I put on my togs, hat and goggles. Then we all got on board, turned on the GPS tracker and I swam into the beach for the official start. I was very happy at the start of the swim; the sun was shining on my back and the water was much warmer than I had expected – a balmy 14.5ºC. As well as this, there wasn’t a jellyfish in sight, something that put me at ease! After a few minutes, the ferry came against us and we got a big wave from all on board. As I was swimming on the western side of Inishbofin, it became cloudy and the wind started coming from the West. This wasn’t the ideal wind direction as we wouldn’t get the same assistance from a westerly wind as we would from a southerly wind, and it was a southerly wind that was forecast. In any case, I kept swimming from feed to feed. After about an hour and a half, we cleared the shelter of Inishbofin and entered the Tory Sound. The tide was running from East to West, directly into the wind, and because of this the waves rose slightly. This didn’t bother me too much as the lee of the boat was giving me some relief from the wind and waves. We continued on like this for about another hour until the sun came out again. About three hours into the swim, the waves became much higher for between 30 minutes and an hour and there were white horses. That was a tough half hour to an hour. At the last feed, however, it calmed down a lot and that gave me a chance to go ashore at my ease. I was very relieved when I was able to see the bottom underneath me as I was starting to get some pain in my shoulders by that time. Once we got to the pier, Anne Marie pointed out the beach to me and I swam into it. When I arrived at the beach, 4 hours 20 minutes 34 seconds after I started, I stood up on the sand. There was a crowd of children on the beach and after a few words with them I turned around and there was a good crowd on the pier as well. I was very surprised as there’s usually no such welcome at the end of a swim like that. After having the shower and cup of tea with biscuits, we went back to the harbour. Then, we decided to go to Caife an Chreagáin for some food. On our way there, we met the Queen of Tory who was looking after a young falcon who had landed in Tory after going astray from County Clare! He was a magnificent bird. We met Patsaí Dan again in the café and we all had a great chat. After eating our fill, we went back to the boat and hit the waves. But before we could leave, a young boy asked me if I was going to swim back to Magheraroarty because the “rule” is that if you come on the boat, then you can go home on the boat, but if you swim out, you have to swim back! Half an hour after leaving Tory, we were almost back at Magheraroarty pier, but our adventure was not over yet. Suddenly, four or five bottlenose dolphins came right up to the boat. They stayed with us, playing, for about ten minutes. That really made our day! That was pretty much the end of the day, a long day, but an enjoyable one at the same time. The excitement continued for a few days after the swim; it was in the local papers in Donegal that a young man, from Cork even, had swum from the coast out to Tory and Anne Marie and I had to do an interview on the local programme, Barrscéalta, on Raidió na Gaeltachta. I’d like to thank Anne Marie Ward for all her help and advice in organizing this swim and during the swim itself. I’d also like to thank Brendan Proctor and John Joe Roland from the Sheephaven Sub-Aqua Club for their great support. Finally, thanks to the people and King of Tory for the great reception that they gave us at the end of the swim!